Ye Hai Mohabbatein Shagun informs Ruhi that Seema may be fine with Abir and away from her parents. She asks Ruhi not to take any tension regarding Seema. She heads to Bhalla house to meet Ishita. Simmi is panic stricken because of Shaina Shah. 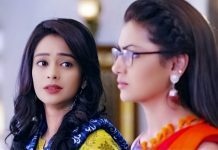 Ruhi talks to Simmi about Ishita and finds her behavior tensed. She wants to know what happened. Simmi wants to avoid the talks regarding Ishita. Shagun arrives home to meet them. She finds Simmi very much troubled. Before Simmi could tell anything to Shagun, Shaina threatens Simmi once again. Simmi stays in pain. Shagun asks Shaina about her London trip. Shaina avoids Shagun and stays rude and arrogant. She leaves from the house on the pretext of work. Shagun wonders what’s wrong with Ishita and now Simmi. Simmi gets threatened by Shaina again and again. She learns that Shaina has installed cameras in the entire house. Simmi realizes that Shaina is posing as Ishita in front of the family. Yug meets her friend with a purpose. Raman suspects Yug. He wants to learn Yug’s intention and motives. Yug receives a shocking parcel with a bullet. He gets invited in a party, where someone wants to reveal the past. Yug hides the secret past. He asks Ranbir to not tell anyone about his secret. Raman wants to know what is Yug hiding. He wants to attend the party and know his secret. Shagun tries hard to know it from Simmi. Simmi gets close to tell her the secret, but gets worried that Shaina is keeping an eye on her. She behaves strange with Shagun. She doesn’t want to risk anyone’s life by sharing the big shocking truth of Ishita’s lookalike Shaina. Simmi doesn’t reveal the truth to Shagun. Yug bonds with the family and keeps them happy. Raman gets a new suspicion on Yug. He is stressed, and spies on Yug. Yug tells them that he has to go somewhere for his work. He doesn’t want to take Aaliya along with him in the party. Shaina threatens to kill Shagun. She compels Simmi to hide the truth. Simmi gets afraid of Shaina. She reacts in fear. Shagun wonders what happened to Simmi. 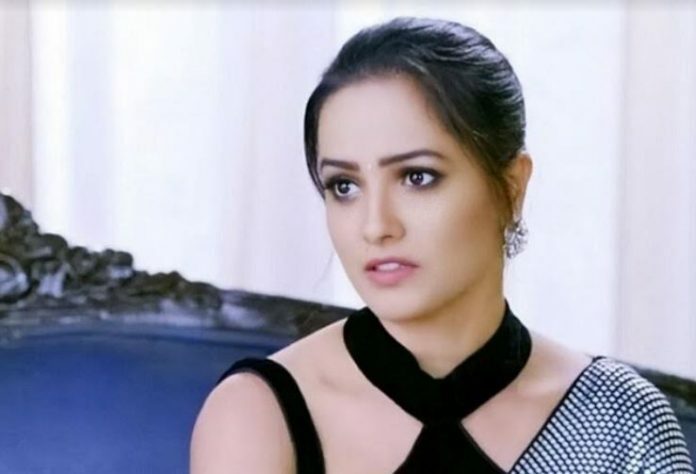 Shagun tells Simmi that she suspects her to be lying and wants to know the truth, so that she can help Simmi in the problem. She tries hard to know what’s bothering Simmi so much. Shaina makes a timely entry. She handles the matter and asks Simmi to remember her warning. Shaina gets into Ishita’s act and scolds Yug even in front of Aaliya. She doesn’t care for Aaliya, which surprises Raman. Raman fears that Aaliya will take an extreme step of suicide if he kicks out Yug from the house. Raman wants to go after Yug by making an excuse. Shaina too has to leave for her meeting. She makes an excuse to leave from the house. Raman is relieved that he won’t have to lie to Ishita now. He follows Yug to know the matter. Karan tries to find Seema to help Ruhi. Rohan advises him to invite Ruhi for dinner. Karan doesn’t want Rohan to turn bitter. Rohan asks him to woo Ruhi by his charm and then break her heart. Karan demands Rohan to quit drinking. Rohan promises to quit drinking if Karan follows his plans. Rohan turns wicked to take revenge on Ruhi and Aaliya. Raman is keen to know Yug’s past.